Coloplast bathing and cleansing products cleanse patients' skin without causing irritation. Each is pH-balanced and formulated with gentle ingredients and extra emollients to provide gentle cleansing. Products are available in no-rinse and rinse formulations. Coloplast moisturising products offer a complete range of moisturising products to help maintain healthy, intact skin and to treat and help prevent severely dry, cracked skin. Coloplast skin protectant products help prevent and treat skin irritation due to exposure to urine and feces. Our range of products includes clear protectants for easy skin assessment as well as opaque barriers. Coloplast antifungal products effectively treat and relieve the itching, burning, scaling and redness associated with candidiasis, jock itch, ringworm and athlete’s foot. Isagel® no-rinse, antiseptic hand cleansing gel nurtures skin with moisturisers as it sanitises. In vitro testing demonstrates that this instant hand sanitising gel is effective against MRSA, VRE and H1N1 and kills 99.9% of most microorganisms in less than 15 seconds. Hex-On® has been used in healthcare facilities for more than 30 years to successfully trap and neutralise organically produced, foul airborne odours. In an average-sized room, the concentrated formula encapsulates and eliminates odours for hours. 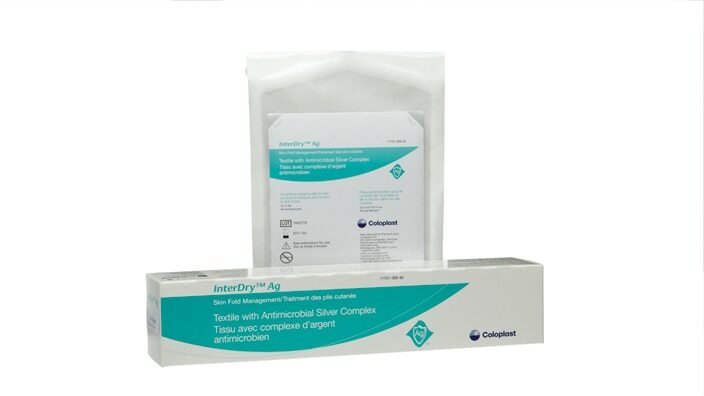 InterDry® Ag Textile with Antimicrobial Silver Complex is a skin fold management system specially designed to manage moisture, odor and inflammation in skin folds and other skin-to-skin contact areas. Visit your local website for more information about our Skin Care products.